Delmer William Judy, age 76, of Petersburg, WV passed away on Sunday, December 24, 2017 at Grant Memorial Hospital. Delmer was born March 21, 1941 in Dorcas, WV and was a son of the late Leander Reel and Glona Lee Judy. In addition to his parents, he was preceded in death by his maternal grandmother, Hattie L. Judy. Delmer retired from West Virginia Department of Highways after nearly 30 years of service. He was an active member of the Petersburg Church of God. He was a former member of Dorcas Ruritan Club. 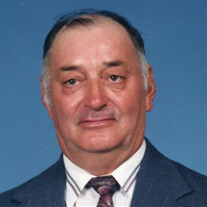 Delmer is survived by his wife of 49 years, Elizabeth "Libby" (VanMeter) Judy; two daughters, Michelle (Steve) Whiteman of Petersburg, WV; Debra Whetzel of Petersburg, WV; four granddaughters, Megan (Josh) Odell, Samantha Whetzel, Shawna Whiteman and Shayla Whiteman; sister, Leona (Olie) Whetzel of Petersburg, WV; aunt, Delphia Newlon of Buckhannon, WV. Family will receive friends Tuesday, December 26, 2017, from 2 -4 and 6 - 8 p.m. at the Schaeffer Funeral Home in Petersburg. Funeral service will be Wednesday 11 a.m. (December 27, 2017) at Schaeffer Funeral Home Chapel with Bishop Aaron A. Davidson and Rev. Johnny Goldizen officiating. Interment will follow in Maysville Cemetery. Memorials may be made to the Judy Family, c/o Elizabeth Judy, 3 Myrtle Avenue, Petersburg, WV 26847.